I've loved dragons for nearly forever. Not for entirely forever, because my first true love was for the T-Rex. And then, in junior high, I found fantasy novels with magic, and wizards, and dragons. They were graceful, intelligent, and strong. And they flew. And had an awful lot in common with my beloved T-Rexes. I was hooked. 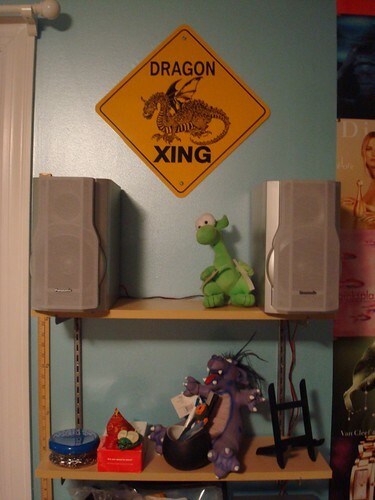 In high school, one of my good friends bought me this dragon crossing sign. It hung on my bedroom door and moved with me when I moved out. It's hung in every abode since, in one place or another. It's now come to rest in my craft room, next to my collage wall and above my stereo. And everytime I look at it I think of my friend. She also came to college with me, where we roomed together for three years. My hubby bribed her with cookies to make sure he stayed on her good side when they met. Three and a half years ago, she stood beside me as the hubby and I wed. Last year, I stood beside her again, this time she was the one saying those vows. I talk to her on the phone now, separated by a couple thousand miles, nearly 15 years after we first met. It only feels like yesterday.